The Seattle-Tacoma Airport has repurposed its empty land and is now hosting 500,000 honeybees as part of a partnership with nonprofit group The Common Acre. 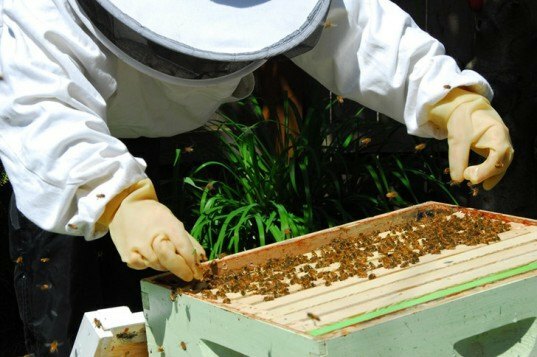 In the midst of mass bee die-offs and fears about common pesticides, the airport hopes to help boost declining bee populations and ensure healthy genetic diversity. Bees and airplanes may seem like a strange combination, but they’re far the first creatures to be introduced at airports. Goats are being used for weed control at Chicago’s O’Hare Airport, and millions of worms have been brought into Charlotte Douglas International Airport in North Carolina to consume waste, just to name a few examples. Airports are so loud that no one wants to build residential or commercial buildings nearby, so they end up being surrounded by lots of vacant land. With Seattle-Tacoma in particular, access to the surrounding land is restricted, so the bees won’t be disturbed by the general public. The minds behind the project are hoping that their efforts will inspire other airports around the country to start taking similar steps. Check out this recent video from Bloomberg, to see some of Sea-Tac’s beekeepers introduce themselves and explain a little bit more about the project.